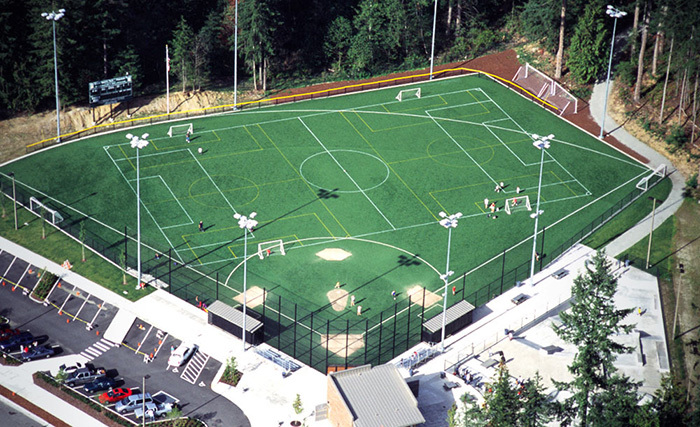 Mill Creek Sports Park aerial view. Photo courtesy of HBB Landscape Architecture. By Richard Van Winkle, News of Mill Creek. After 13 years of heavy use, the Mill Creek Sports Park’s artificial turf is slowly becoming a safety concern for the many youth sports organizations that use it for soccer, baseball, and softball games. Although the field is inspected, maintained, and certified safe every quarter, seam tears and the loss of cushioning on the 64,000-square-foot athletic field increase the chances of injury. As well, the old lighting system is very inefficient and expensive to maintain compared to today’s LED lights. In 2016 city staff crafted a scope of work for a project to improve field safety, to reduce lighting and maintenance costs, and to allow disabled people field access. The Mill Creek City Council approved the estimated $775,000 project as part of the 2017-2018 Biennial Budget. However, the city depends on joint funding from other stakeholders for capital project such as this. Working with Washington State and Snohomish County, city staff obtained agreement for the project’s joint funding. Snohomish County Councilmember Terry Ryan personally announced the county would contribute a $100,000 grant for the project. Mill Creek Recreation and Tourism Manager Brian Davern worked with the Washington State Recreation and Conservation Office to get a $250,000 grant ranked number six out of 18 approved projects. However, the Washington State 2017-2018 Capital Budget that funds these projects didn’t pass, even after a number of special legislative sessions. State lawmakers are holding up the capital budget because they can’t agree on a separate and unrelated piece of legislation regarding water well permitting. Although design engineering for Mill Creek’s project is going forward, the actual construction will be held up if state funds are not made available. “Another direct impact to the City is that we would lose power consumption savings by further delays,” said Davern. According to a Mill Creek news release, "City staff are united in urging Washington legislators to pass a capital budget that includes funding for capital projects important to communities throughout Washington including Recreation Conservation Office projects." Click on the following link if you would like to signup for our free weekly email newsletter: Email newsletter signup form. Mill Creek Technologies designed and implemented this website with HTML5 technology from Adaptivethemes for optimal viewing on mobile devices such as smart phones and tablet computers.